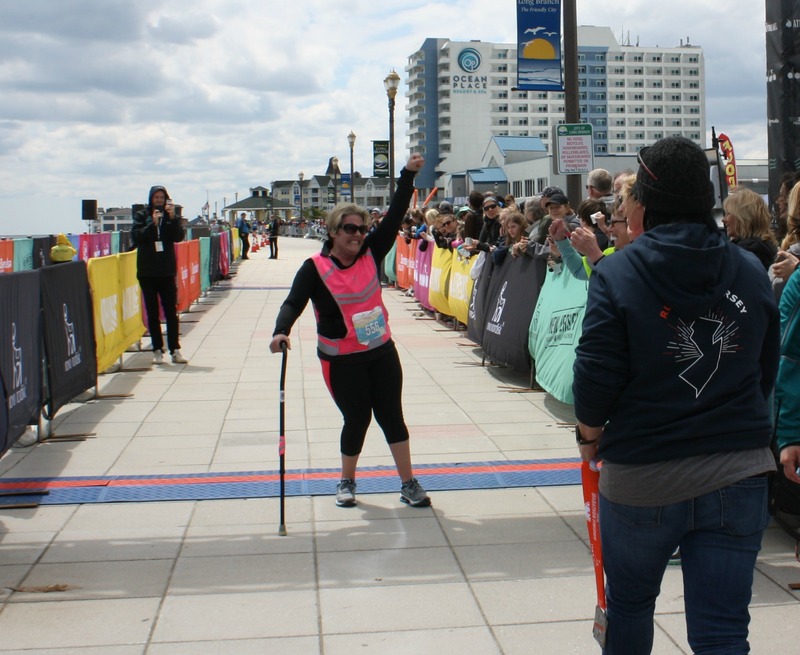 Since I crossed the finish line at the New Jersey marathon, I have been overwhelmed in processing everything that happened over those 26.2 miles. First, I have to get this out of the way: I AM A MARATHONER! That still seems so unreal to me. One of my trainers said it best, “Some things can’t be explained. Some things can only be experienced.” Although some parts of the experience are still mentally foggy to me, I keep coming back to the same thought: I used every bit of my training…every single, last bit. Whether it was hitting the wall on a long run, braving the elements, core strength, isometric movements of my feet to carefully place them on the wet pavement, or falling safely, I used all of the techniques I have learned and practiced over the past nine months of training. When we started out, all seemed as if it would work out fine. Yes, it was at night, but I had prepared for that, and at this point, I have run in the dark many times. Then came the rain, and it just kept coming. First reports were that it would be at 2:00 a.m. and 4:00 a.m., then it was supposed to conclude by 3:00 a.m., then 5:00 a.m., then 8:00 a.m. Rain made for slick pavement and my first fall, by my best guess around mile 3. Honestly, most of the rest was a blur because I was just focused on putting one foot in front of the other. I had no idea it was raining as hard as it actually was. The first bathroom break, at mile 6, went as planned and I went back to work. Around mile 12, Joni joined in and traded out for Steve, who did a fantastic job navigating the first half of the marathon. Those responsibilities were taken over by Kimi, Carmen, and Pat. Katie was on nutrition and social media duty. Joni was on…let’s call it…Jamie’s mental maintenance. Originally, she had wanted to run the full race with me, but I asked her not to because I knew I needed her to show up fresh because I would not be. By the time she arrived at approximately 4:00 a.m. near mile 12, the entire team had been rained on for hours. Then came the wall. Most marathoners I have spoken to talk about hitting the wall at mile 20. For me, the wall came at mile 18. I stopped around this point for the third bathroom break on the schedule. I had the chance to sit down, even if it was in a porta-potty on the side of the road. Joni went in to help me with my clothes, as they were soaked. I will never forget it. I hugged her crying, and just said, “I am so tired.” She took my face in her hands, and said, “You have it, and you are going to do it, but you have to believe it.” I was so grateful she was there. I really think just having the opportunity for that emotional release was so important. I just continued, one step at a time. The last eight miles were excruciating. I had to dig deep…deeper than ever before. 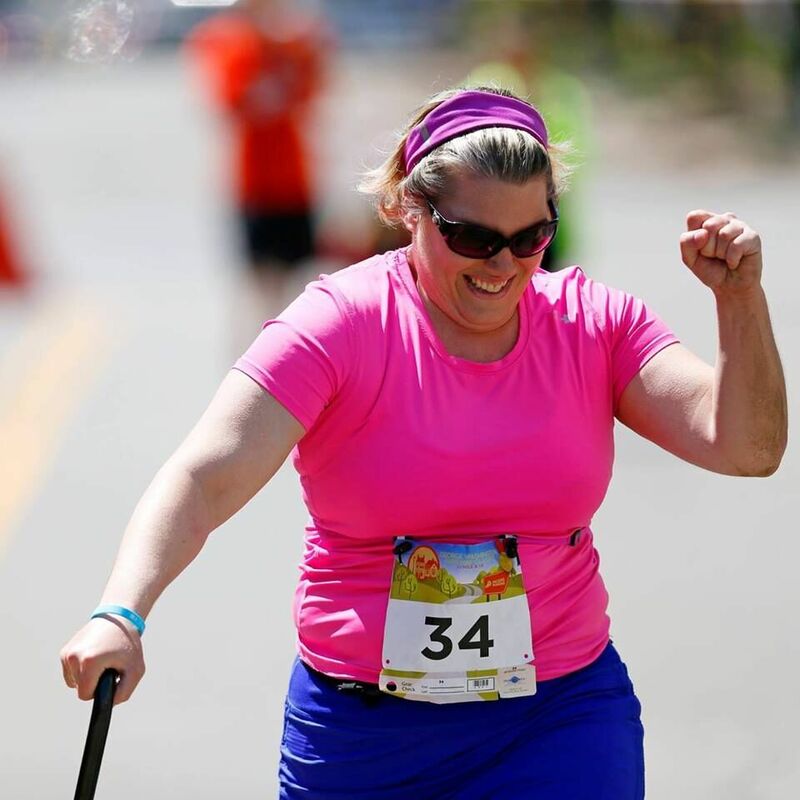 There were so many people cheering for me—other runners, spectators, people with and without disabilities. I wanted to cheer them back, to thank them, and express my gratitude, but I just kept a laser focus on moving step by step toward the finish. Someone asked me when I knew I had it. Truthfully, the answer is not until I saw the 25-mile mark. I have always had the mantra in my racing, no matter the distance, that I can always do one more mile, so when I hit mile 25, I knew I could will myself to the finish. I did just that, with a total finish time of 14:33:07! I usually do not get overly proud of my running accomplishments. More than anything, usually it’s another finish to add to my bucket list, and I love the rush of the finisher experience. However, this is different. I am extremely proud of this race and this finish. It took every ounce of physical, mental, and emotional energy I had. I need to thank my amazing team of friends, who assisted me on the course and as spectators. Everyone—Katie, Joni, Carmen, Kimi, Pat, Steve, Michael, Kabar, Hilary, Lisa, Murphy, Carrie, Jennifer, Adam, and my mom, and frankly, anyone else I missed along the way. I could not have done this without them, and so many others. I am so blessed to have so many amazing people in my tribe. I am so thankful for each of them and what each of them bring to my life. I also want to say thank you to everyone who believed in me and supported me through this process. First, thank you to Lisa and Amanda Reeves, Kathy Dalby, and Pacers Running. Who knew that a casual dinner conversation following an award ceremony for accessible racing would lead to this amazing experience. I have said it many times before, but it is so important to surround yourself with people who can see your full potential even before you can. I have always been confident in not all, but several areas of my life. Those where I lack confidence are still a work in progress. Despite confidence in most things, a marathon was not something I thought was possible. People would ask me all the time if I planned to run a marathon. I could never quite bring myself to say no. Instead, I would say that it was a logistics problem. Somehow, I let that protect me from having to try, but my friends could see the potential for success, and the depths of my grit and determination to achieve this goal long before I could. They helped me remove obstacles that I let stand in my way. Without this group of amazing friends and supporters, none of this would be possible. Thank you to all of my trainers at Fitness Together, who worked with me tirelessly week after week for nine months to design and execute customized workouts to meet and exceed my needs. I cannot express enough how much each trainer, Michael, Kabar, and Jim, all of whom I did not know at the beginning of this process, approached my training with enthusiasm, dedication, intellectual curiosity, and most of all a boundless commitment to my success on race day. One of the greatest blessings of this whole experience is getting to bring these exceptional people into my circle. I adore each of them for all they have done. Thank you to Michael and Kabar for braving race day with me by driving the support vehicle with all of my supplies. Thank you Mizuno for turning me on to some amazing, comfortable, and durable running shoes, the most important instrument of training and race day! Thank you to Mighty Meals for supporting my nutrition plan, and ensuring I had healthy, delicious, and satisfying food to propel months of training! Each of these aspects were key elements to my success, without which this finish would not be possible. In my first days of recovery, I have spent a large amount of time responding to messages and texts. (I am still not completely through them all, so if you have not heard from me, you will). Thank you to everyone who reached out with cards, letters, and messages before, during, and after the race. Thank you to all who have followed this journey. The response has been amazing, and I feel so loved. Thank you! I have no idea what comes next because I never planned any of this. I was only supposed to run one 5k. I am excited for the next step and finding out where this road leads. Nothing is impossible!